If you’re overwhelmed by mobile app metrics, you’re not alone. What’s the best way to track app performance? How do I know if I’m interpreting mobile analytics metrics correctly? 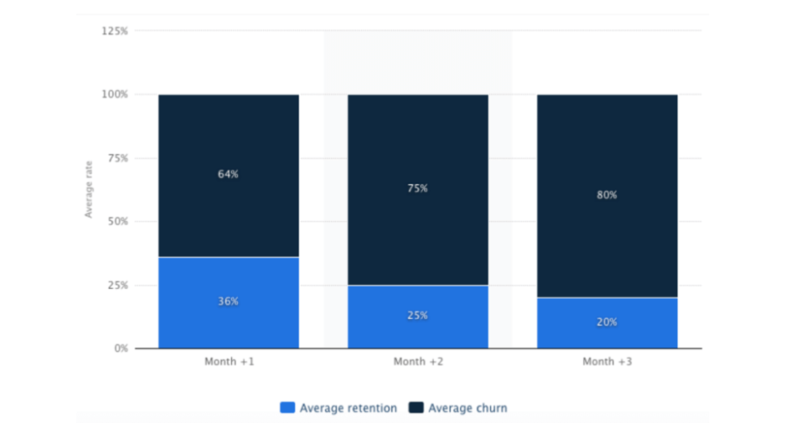 Which metrics will actually help me improve long-term app engagement and retention? All the data in the world won’t help you grow your mobile app unless you know how to interpret and apply it. Mobile ROI doesn’t have to be complicated. With the right mobile app metrics in place, identifying problems and solutions can be painless. You can’t grow your mobile app if you don’t win over new users — and you can’t win over new users if you don’t understand where current users come from. That means tracking downloads and attributing them to specific acquisition channels. Let’s say $5,000 on Google AdWords nets you 125 downloads over 3 weeks. But the same investment on the Google Play Store gets 10x that in 3 days. Daily download and attribution tracking shows you where to invest your marketing resources so you can meet lofty download goals in record time. New Downloads – # of new downloads (daily, weekly, or monthly). Download Attribution – Which channels are new users coming from? Use this data to optimize marketing spend and improve ROI/customer LTV. Convert Web Visitors into Mobile Users. Encourage web visitors to download your app by adding a “Download the App” button and offering incentives like loyalty points or a discount on their first in-app purchase. Launch a Referral Program. According to a study conducted by Nielsen,1 92% of people trust referrals from friends. 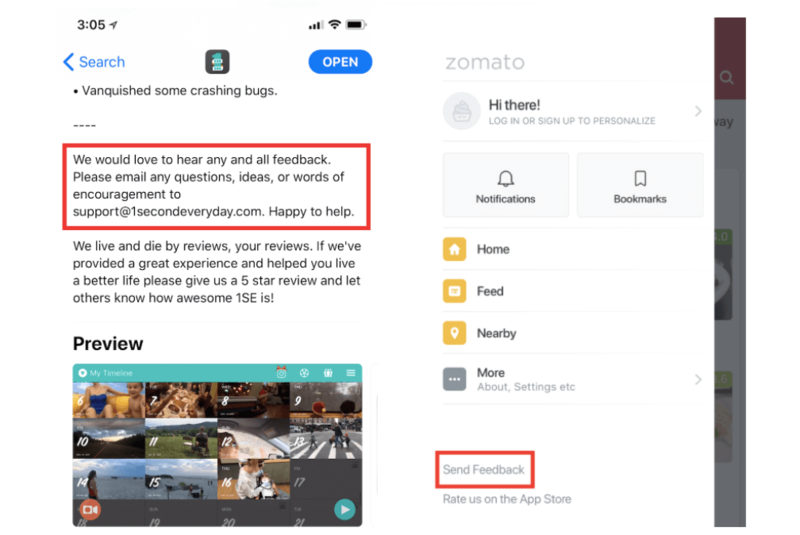 By incentivizing current users to recommend it, you can rapidly expand your user base and provide powerful social proof to prospective users. 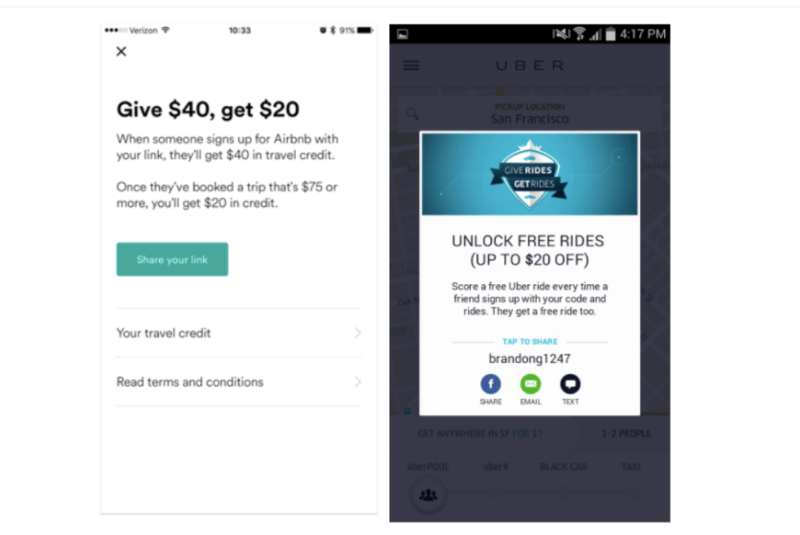 Companies like Airbnb and Uber turn mutual incentives into powerful customer acquisition engines. Effective App Store Optimization. Higher search rankings mean better chances of getting featured, better visibility, and more downloads. Include search keywords in your listing’s main title, spotlight your app’s main features and benefits in the app description, add eye-catching screenshots of the UI, and include the version and date of last update. Users are more likely to download an app that’s actively maintained and adding new features. If your activation rate is 85% or above, you’re in great shape. Anything lower calls for a deeper analysis to identify and fix activation issues. Typos – With tensions surrounding malware and identity theft running high, users question an app’s authenticity if they encounter typos. Confusing icon – Think Soundcloud: just from the name and icon, you can tell it’s a music streaming app. Requiring lengthy registrations – Unless it’s absolutely necessary, let users poke around a bit before creating an account — or at least limit the process to basic contact info. If we had 300 activations and 500 downloads this week, our activation rate would be 60%. Not too shabby, but room for improvement. Create onboarding materials. Send an email or push notification campaign highlighting your app’s main benefits or key features. Incentivize activation. To boost its Kindle app user base, Amazon offered existing customers a $5 credit for signing in to the Kindle app. Offer in-app exclusives. This could include specialized content or early access to new features and products. But keeping mobile app users engaged isn’t easy. The average app loses over 77% of its daily active users (DAUs) within 3 days after install. So how can you keep users coming back to your app? Get actionable user data by tracking retention cohorts. This is the monetary value a customer has netted you to date. This data can help you build tiered loyalty programs to retain your most valuable customers. To ensure your app stays profitable, LTV needs to eventually exceed Cost Per Acquisition. For an easy way to calculate LTV or CLTV, use our Customer Lifetime Value Calculator. Deliver loyalty perks. Reward points, special discounts, and exclusive access give users a reason to keep visiting your app. Add new features and content. Camp Gladiator’s new CG Fit feature tracks physical changes workouts produce and suggests meal plans. These are just a few ideas to get your retention engine revving. For more, check out this comprehensive Guide to User Retention. Multiple studies confirm a strong link between engaged users and revenue growth.3 Put simply, engaged users buy more. Daily Active Users (DAU) – # of users active on your app in a given day. Weekly Active Users (WAU) – # of users using your app in a given week. Monthly Active Users (MAU) – # of users accessing your app in a given month. Use this data to calculate your app’s stickiness. If you have 3,000 DAU and 9,000 MAU in the month of June, your stickiness ratio is 33%. Retrace your steps. If a cohort has an abnormally low retention rate, follow the data. Where did you lose them, and how did you win them over in the first place? Something as simple as discount codes, new features, or bug fixes can do the trick. A tool like Flows can show you exactly where people are engaging more with your app or dropping off. Conversions are the holy grail of marketing. Say you sent a 10% off push notification to 8,000 users. If 400 of them used the discount code, your conversion rate would be 5%. Tracking conversion rates tells you which messages are moving your sales needle. Once you have a baseline, you can run A/B tests to optimize and find messaging that resonates with your users. First ask yourself: what types of conversions are important for your business? Purchases? Subscriptions? Ad impressions? Think like a user. Pretend you’ve launched your app for the first time. What annoys you or slows you down? Make moving through the funnel as easy as possible. Remove unnecessary buttons or links, simplify your registration process, and streamline your UI. Look for unexpected drop-offs. It’s common to see users drop out of the checkout process when it’s time to enter credit card details. But if you’re seeing an unusual drop off where users add their shipping address, there could be a UI issue or bug that’s causing problems or preventing users from moving to the next step. Pro tip: Compare daily uninstalls with the number of daily downloads and daily activations to get a net result of your mobile app growth. Let’s say roughly 10 users uninstall and 35 new users are activated each day. That represents an uptick of 25 users each day. If those numbers were reversed, you’d have a serious churn problem on your hands. Bugs – 80% of app users ditch buggy apps after 1-3 uses. Latency – 49% of app users expect screens to load in 2 seconds or less. Battery drain – 36% of mobile app users report heavy battery usage as a reason for uninstalling an app. Even more interesting, mobile app users prioritize quality and star ratings over price8 when selecting apps. Retargeting ads. Retargeting users you’ve lost on social media with a discount or valuable feature update can help you win them back. Surveys. We all have blind spots. Sometimes users leave because your app has performance issues or doesn’t meet expectations. Discounts and exclusives. 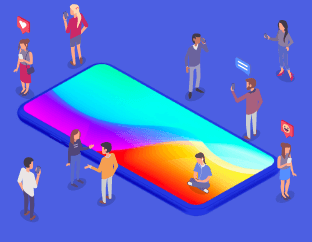 A recent Google study9 found that 38% of app users would re-engage with an app if offered a discount, and nearly 25% would return for exclusive or bonus content. 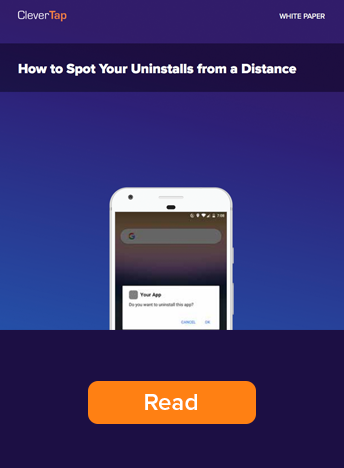 Learn to identify the tell-tale signs of uninstall long before it happens — and how to keep more users from churning. As the mobile app marketplace continues to expand, marketers must work smarter than ever before to capture and retain user interest. Luckily, there’s a tool that makes tracking, managing, and applying insights from mobile app analytics easy. See how CleverTap can help grow your mobile app by scheduling a demo with our mobile marketing experts.